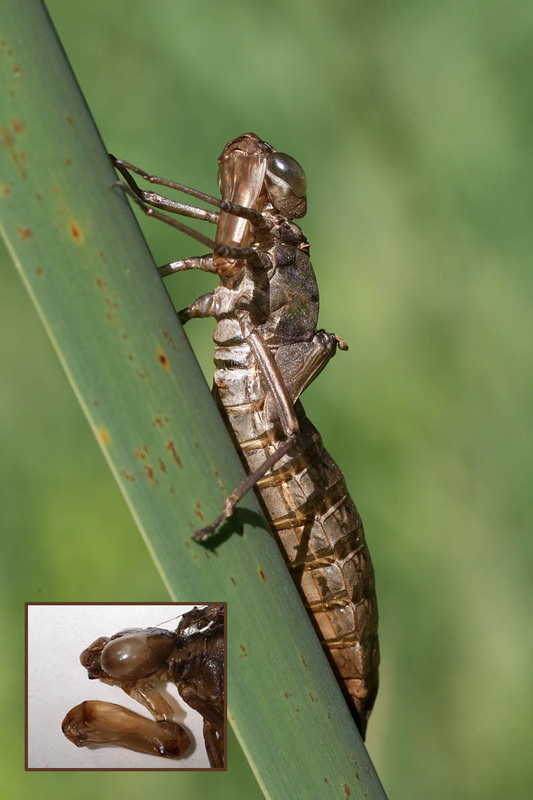 When a dragonfly larva crawls up out of the water onto emergent vegetation or a rock to split its skin and emerge as a winged adult, it is in its most vulnerable state, for until its wings are pumped up and dry, it is incapable of flying. Often for two or three hours a newly-emerged dragonfly will cling to the substrate, pumping hemolymph into its wings until they are fully expanded and then hang there defenseless while its exoskeleton and wings begin to harden. Only then does pigment in the dragonfly’s body become apparent, and its formerly pale, colorless head, thorax, abdomen and wings (see inset) assume their true colors. The pictured Common Grackle has taken advantage of this precarious stage in a dragonfly’s life cycle and collected several dragonflies to feed to its offspring. The dragonflies’ lack of color indicates that this predation took place while the dragonflies were still flightless and before pigmentation was present. The Common Green Darner (Anax junius) is one of our most common dragonflies. often seen near ponds. The family of dragonflies known as “darners” consists of species with large eyes and long abdomens that tend to rest infrequently and when they do rest, usually hang vertically. 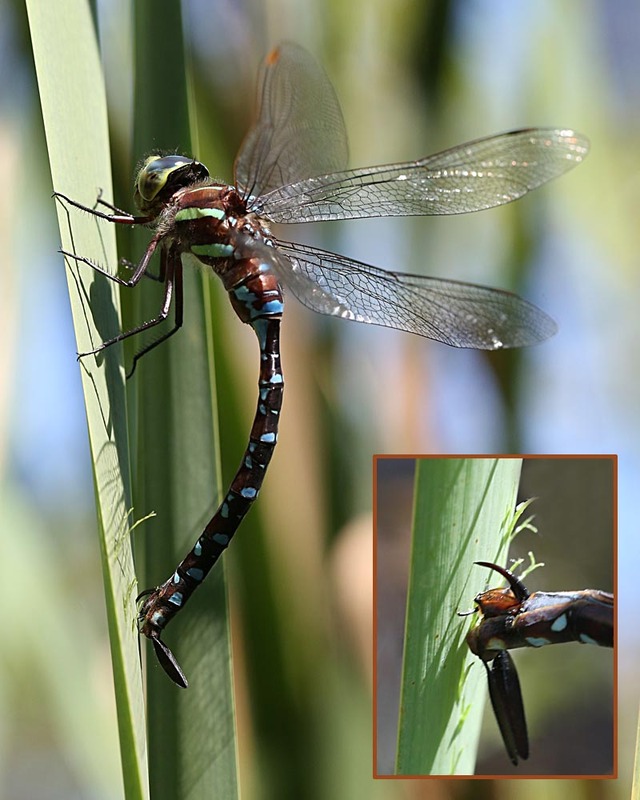 The Common Green Darner is the only North American darner in which the male and female usually fly in tandem when the female is laying her eggs on emergent vegetation. Up to 50 of the world’s 5,200 dragonfly species migrate and the Common Green Darner is one of them. In the fall most (but not all) adult Common Green Darners migrate south to Florida, eastern Mexico and the West Indies. Huge clouds of migrating dragonflies have been seen along the East Coast, Gulf Coast and the Great lakes in autumn. Transmitters weighing 1/100th of an ounce that have been attached to migrating dragonflies confirm that they migrate much like birds. Just like avian migrators, they build up their fat reserves prior to migrating; they follow the same flyway as birds, along the Atlantic Coast; and like birds, dragonflies don’t fly every day but stop and rest every three days or so. A visit to a pond will usually include sightings of dragonflies and the more delicate damselflies. Both of these types of insects are in the order Odonata (Greek for “tooth,” referring to the serrated jaws of the adults). They are separated into two suborders, due to their wing shapes and sizes. The wings of dragonflies differ in shape and size (hind wings are broader than forewings), whereas damselfly fore and hind wings are similar in shape, with the hind wings sometimes being smaller. In addition to wing differences, damselflies have eyes that are separated by more than an eye’s width, whereas dragonfly eyes either touch or are separated by less than an eye’s width. Damselflies are smaller and more slender than dragonflies and perch with their wings closed over their abdomens or held slightly spread. Dragonflies at rest hold their wings out flat or downward. In addition, dragonflies are more powerful and acrobatic in flight than damselflies. Although these differences distinguish them, damselflies and dragonflies do have many similarities. Both are carnivorous, both spend most of their lives as aquatic larvae, and both lay their eggs in or near water. The sudden hot weather seems to have triggered a mass emergence of dragonflies and damselflies. The emerging vegetation along the shores of ponds is covered with larval Odonates (members of the order of insects that includes dragonflies and damselflies) metamorphosing into adults. The adults, still in the skin of their last larval stage, crawl out of the water, climb up vegetation, rocks, etc., and split the back of their larval skin. The adult flips backwards out of this opening, hangs upside down and then grasps the vegetation and/or empty larval skin while as its abdomen is released. The dragonfly hangs in the breeze while it pumps air into its body, sending liquid into its wings. To appreciate this process called eclosion, compare the size of the wings in the photo insert (recently-emerged adult) with those in the larger photograph, which was taken twelve minutes after emergence. Within a day or so the sheen on the newly-formed wings goes away, the dragonfly’s body hardens and colors start to appear.